The modern home is filled with devices that require an internet connection. Cell phones, laptops, gaming systems, smart TV’s-the list goes on. With so much of our technology reliant on a strong internet connection, it can be frustrating when that connection is slow, or cuts out frequently. When they have a slow internet connection, the first mistake many people make is to blame their service provider. This isn’t always the case though. Most of the time the problem isn’t your service provider or your connection speed: it’s your Wi-Fi signal. There could be several factors in your home that are negatively impacting your Wi-Fi signal strength. Here are five of the most common things around your home that might be affecting your signal. Common building materials, appliances and decorations in your home or office can be causing degradation to your wireless internet signal. If the router is located near a microwave, massive network interference will often be experienced while the microwave is heating something up. Many microwaves operate on the 2.4 GHz spectrum, which is the same spectrum as older wireless routers. You neighbors’ Wi-Fi networks in a close proximity can interfere with your Wi-Fi performance. Crowding is a very common issue, especially in densely populated area. However, there are ways to combat crowding. 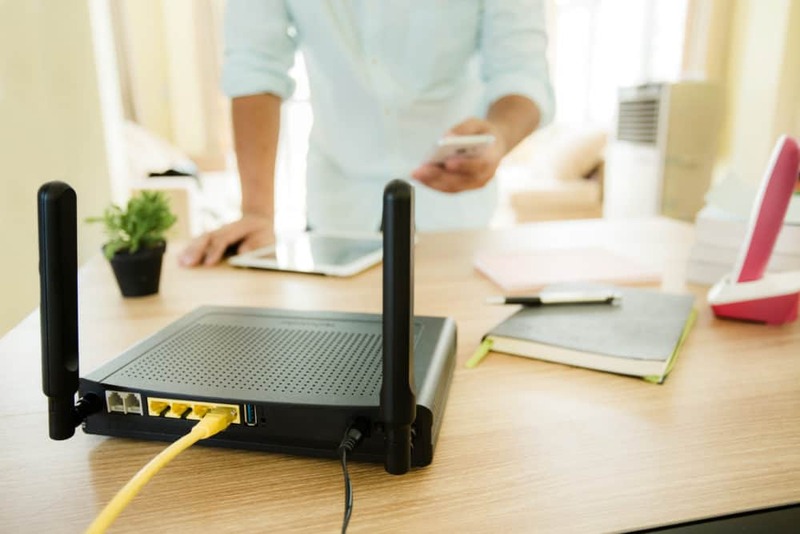 Using a router/modem that supports 5GHz, which is by design less susceptible to crowding that 2/4GHz wireless, will improve your Wi-Fi performance and avoid interference from your neighbors’ Wi-Fi. Walls, floors, and/or ceilings between your device and your router will decrease your wireless performance. Also important is that different materials will impact your Wi-Fi differently. Materials like concrete, water, steel and other metals will impact your Wi-Fi strength more than materials such as lumber, drywall and plaster. You may need to reposition your device, and/or your router/modem to decrease the impact of such materials in your home or business. If your wireless speeds seem slow, your device could be supporting older and slower wireless technologies – Wireless B and G – while newer devices support newer and faster technologies – Wireless N and AC. To achieve faster speeds with Wireless N and AC, the device and router/modem must both support the faster technology. If only one of the devices supports the new technology, the devices will still connect to each other. But only at the speeds that the slowest device supports. The average number of connected devices per household is 5. As a result, the more devices that are connected to your Wi-Fi, the more the signal strength is weakened. By hardwiring large streaming devices, such as your SmartTV or your printer, your Wi-Fi channel frees up for handheld devices. 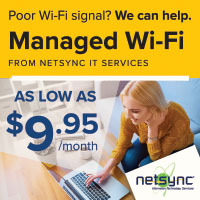 To add hardwired connection ports in your home, or learn other ways to improve your Wi-Fi, contact Netsync® today! Our trained techs can work with you to map out the ideal network setup for your home or business. Ensuring reliable and unbroken wireless connectivity. Too many devices, or a centrally located router, often can plague today’s Wi-Fi saturated home. A Wi-Fi assessment from Netsync® will provide you with a report of where your Wi-Fi is lacking. You’ll also receive an action plan of how to improve your broadband experience in every corner of your home, on every device you need. Learn more about about Wi-Fi assessments from Netsync® here.